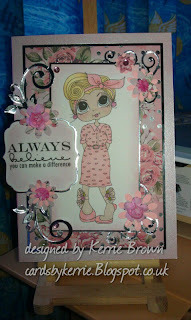 Today i would like to share with you not a card but a folder i have created to store my printed off Sherri Baldy Digi's . I created the folder using Creata Kraft card which is a very sturdy card and was perfect for the job . As you can see i have used a wonderful and sweet fairy image 6122 coloured her in purple and pale pink tones using my Pro markers.The picture above is the front cover of my folder. I have decorated the spine of my folder and added a label so i know what folder is when when it is stored . The above picture is of the inside of my folder as i wanted it to look just as pretty on the inside as i did the outside . All products i have used are from Creata . The Gems and 2 small brads are from my stash and i used pro markers to colour my image . A New Besties Challenge - Punches and Dies! It's Monday so that means time for a new challenge at Besties Challenge. 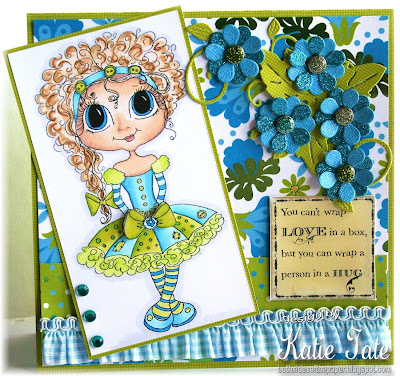 The challenge requires the use of one of super sweet images from Sherri Baldy and this week we want to see you use "Punches and/or Dies" on your card. I had some glitter paper and brads that were just waiting to be used and I think they added the touch of bling that this card needed. Next week you'll see me in a different spot but don't worry I'll still be creating with Sherri's gorgeous images and for now I leave you with the task of punching your way to an enter in the Besties Challenge! 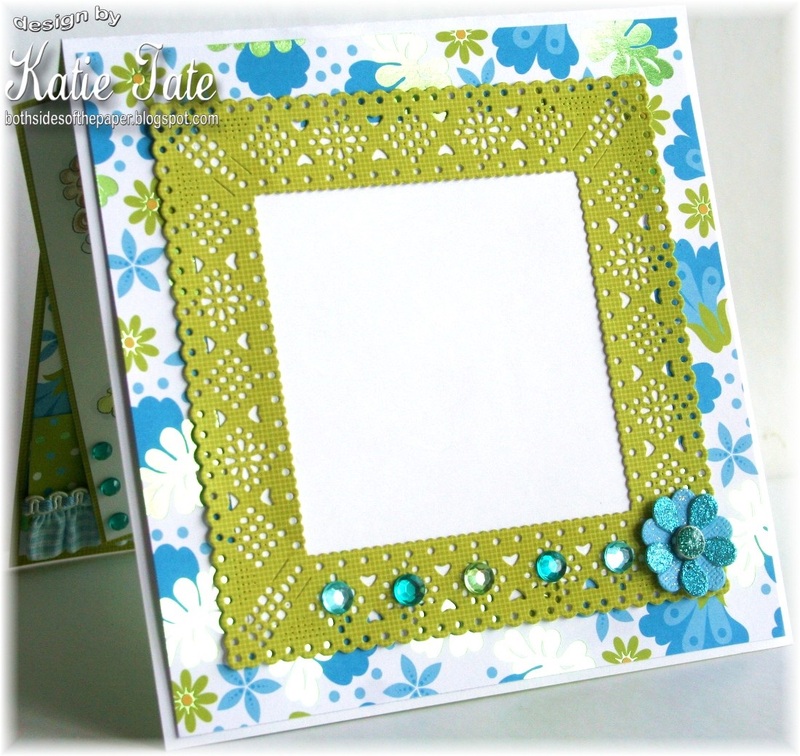 I have today a basic easel card to show you using 2 creata scallop card blanks. I have covered it with creata metallic card stock. Cut various circle die shapes in black mirror card and mounted that onto the top of the card. Feathers bling and pearls are added to the side with the black roses and bling. 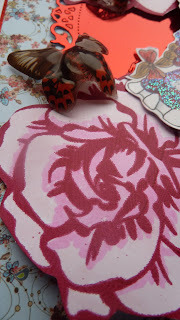 For the easel stopper i have used more circle die shapes, roses, feathers, hat pins and ribbon in strips. Ive used papers by Creata in blues and pinks to match my coloured image (coloured with copics) Matt & layering is using Silver Mirror Board by Creata - i diecut the fancy circle using the parchment and the cut a matt using more of the pink paper. 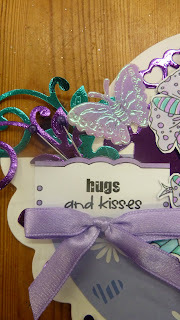 the Swirls and flourish dies are also from Creata. 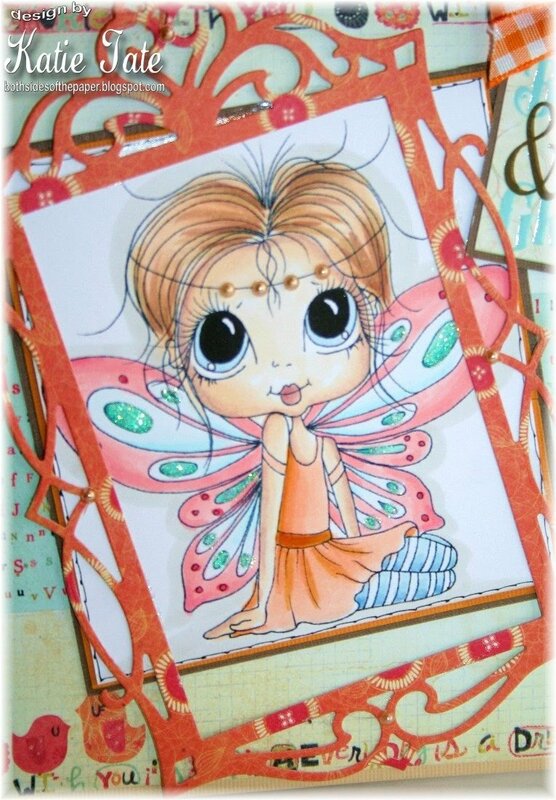 Scrapbook Stamp Society Called "Tiffany and Squeek"
"For the Love of Cardmaking"
Hope that you all are great and enjoying your Besties ... they fun to play with...i just love them . 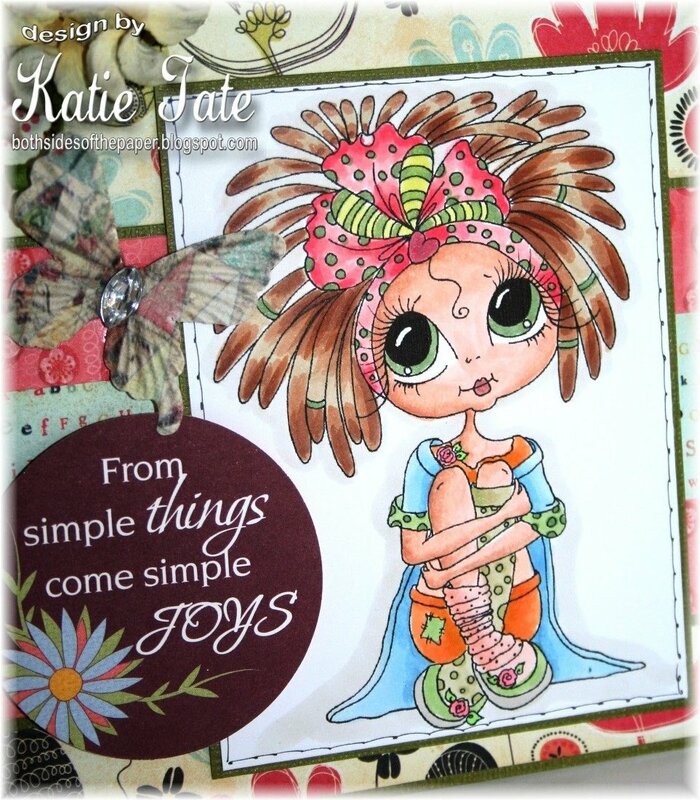 Today it is my turn to share my DT card . 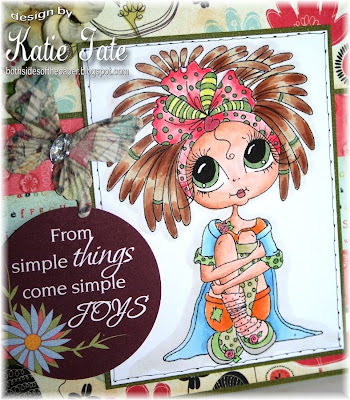 Using one of Sherri Baldy new little cutie sitting on the moon ...she is just adorable .. so beautiful .. perfect for new born card and new other projects. You can get the image from HERE, a cutie little boy is also there . It is a step-up card, using new born baby paper with yellow cardstock, with cutie little buttons and love heart banner . Hope that you like what I have to share with you . Good morning . 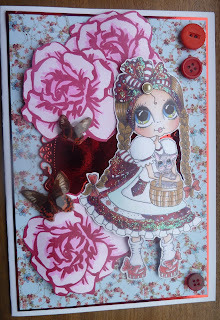 Today i am sharing a card i have made using image 697 .. Dosn't she look wonderful in her pretty dress and boots with the shoe laces untied . 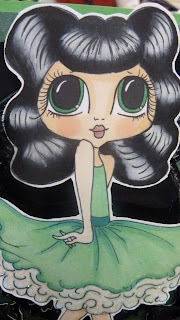 I have used pro markers to colour my image and matted and layered the image onto Creata craft card . 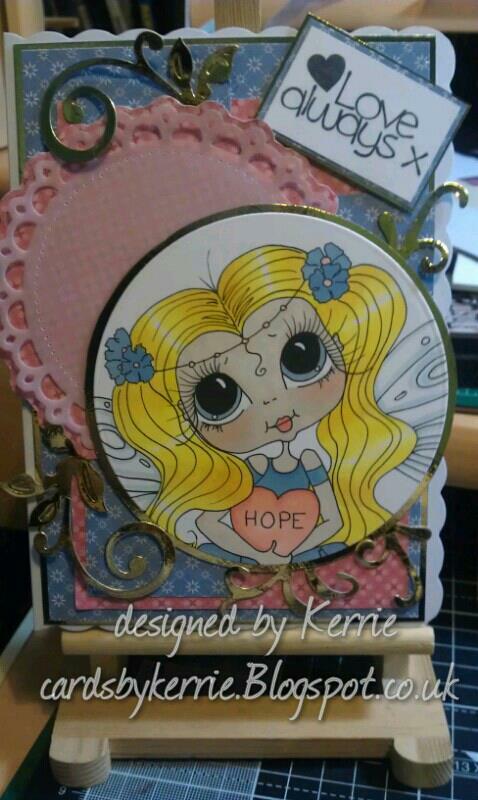 The base card is also Creata craft card which i have stamped and inked with white pearl embossing powders . The flower and the Dragon fly are both By creata. I have also stamped and heat embossed them with the white pearl to match the base card . I have taken the 3 main colours from my image and used ribbons to give a little extra touch . 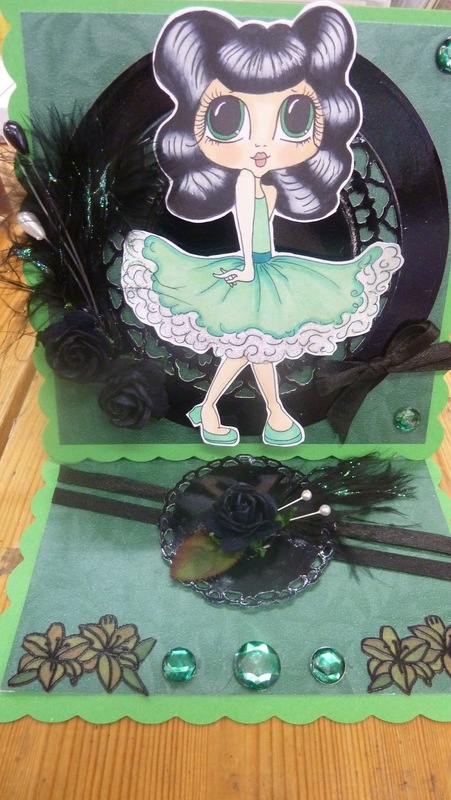 I will also be entering this into the ribbon challenge as a DT make . 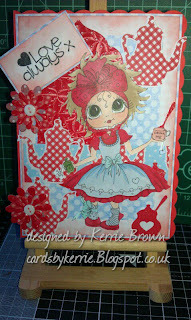 My Besties New Ribbon Challenge! It's Monday so that means time for a new challenge at Besties Challenge. The challenge requires the use of one of super sweet images from Sherri Baldy and this week we want to see you use "Ribbon" on your card. 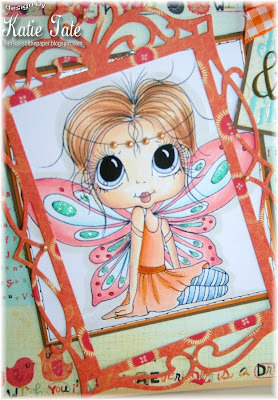 Oh my goodness the Butterfly Fairy image I chose is so cute! 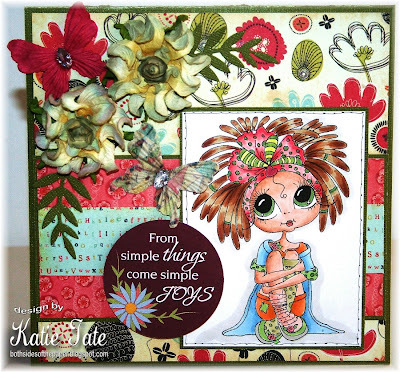 I think she looks like a real "flower child" and the papers I chose have a kind of hippie feel to them too. 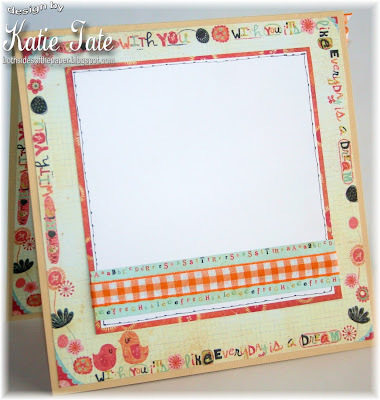 I love this die cut frame and although it is a little big for a 6" square card it works at an angle and I like the quirky feel that it gives to an elegant frame. I hope you liked this one and that you will go over to the Besties Challenge and join with us. 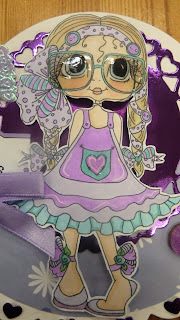 a rocker card from me today using sherris fabby geeky image. 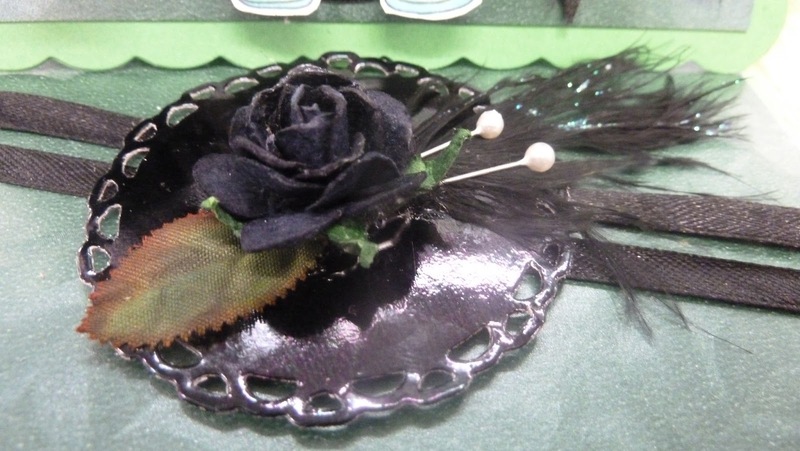 I have cut the card shape using the largest scalloped circle then folded it in half. 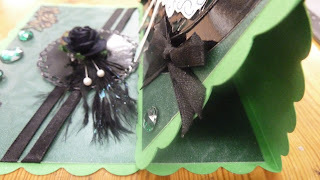 Next cut a plain circle to add to the top of the folded card. 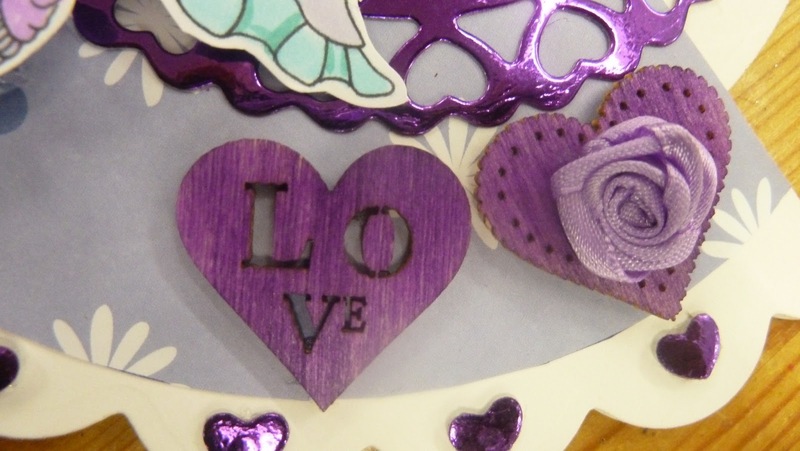 Cut a scalloped heart die shape in mirror card. 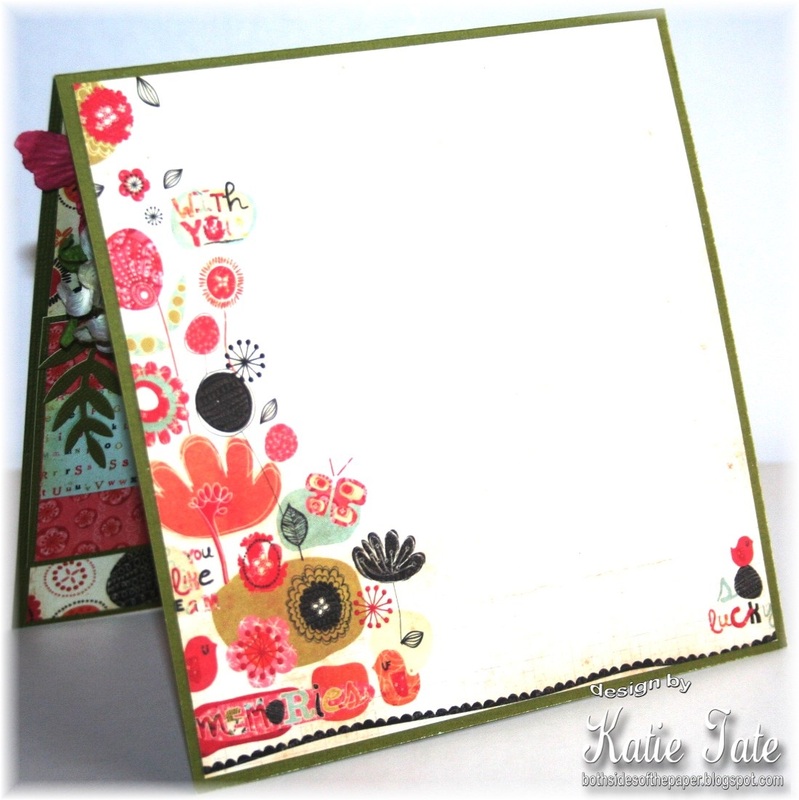 Applied joy crafts scrapbook paper to the bottom of the card before adding the heart circle die on top. Coloured the digi with SN markers and cut out close to the edge. Added glossy accents for her glasses. 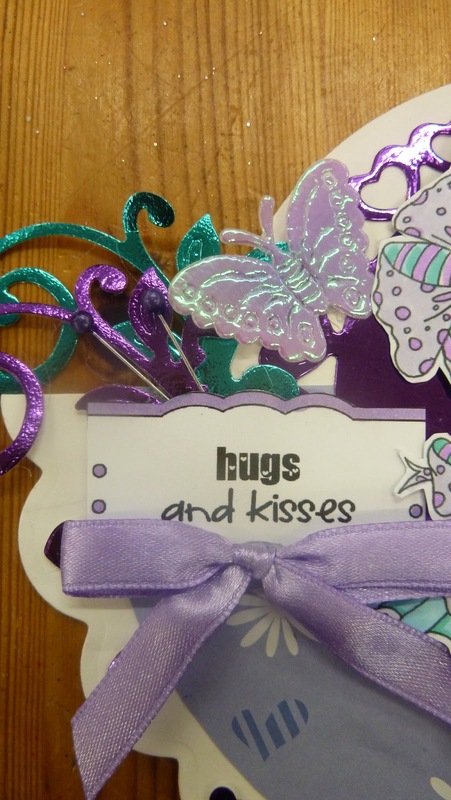 Embellished the card using mirror card flourishes, sentiment, hat pins, butterfly, wooden hearts, ribbon roses, bow and heart bling. 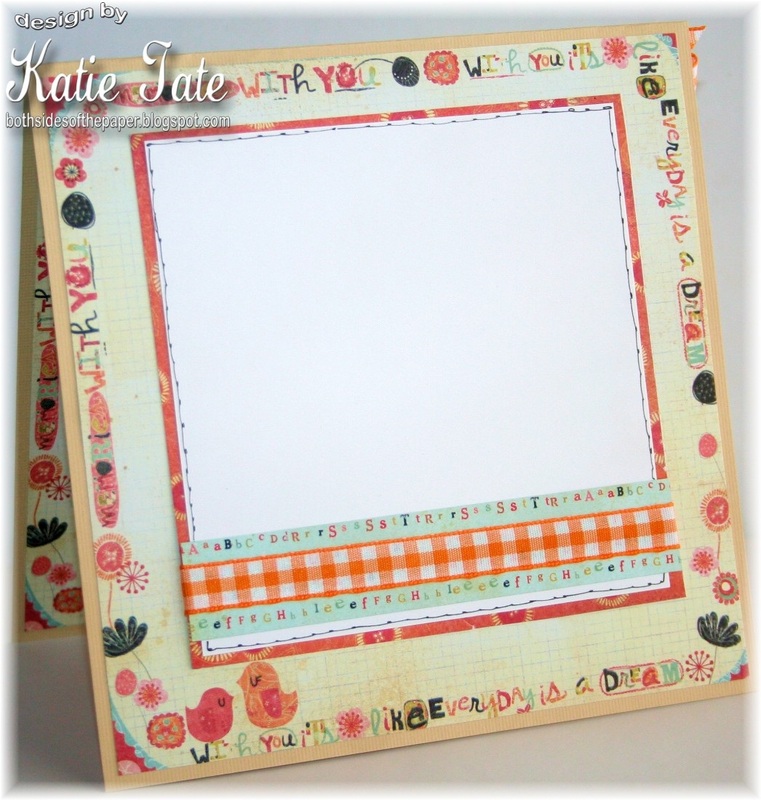 When i see this Digi I could not resit teaming with the fab Creata backing paper and a few scrap pieces of papers to match the colours of the backing paper. I coloured the Image using Promarkers and cut out to attach to the front as i didnt think that a white background would work with this card. I have cut out smaller motif's from the paper to use as embellishments. The stamp was a freebie from a magazine. Ive also used some Tim Holtz distress inks in Fired Brick and Faded Jeans around the edges of the backing papers and the sentiment. I really do love bright colours lately and am stepping out of my comfort zone more and more which i am enjoying. I honestly try to design cards a way that i don't think that others will. This cards flowers were made with a hand punch and a Quikutz stem die. Very simple! Mounted on a Center Stairstep Card. Hope that you like what I have to share with you. 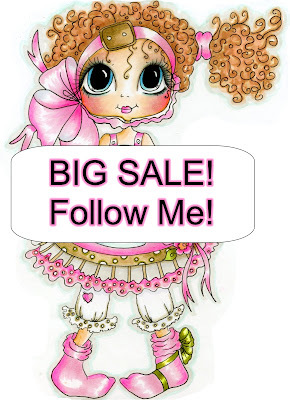 Thank you so much for stopping by and taking a peek. My Besties New Challenge - Flowers! It's Monday so that means time for a new challenge at Besties Challenge. 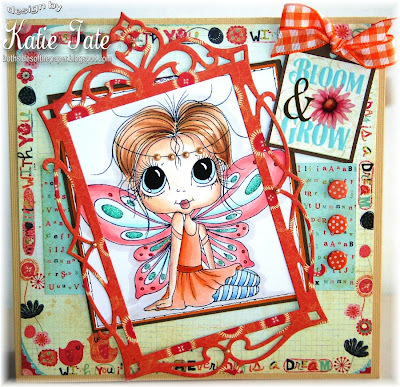 The challenge requires the use of one of super sweet images from Sherri Baldy and this week we want to see you use "Flowers" on your card. 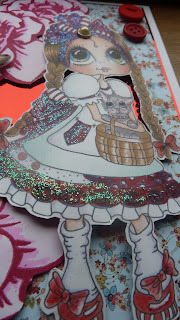 For this card I chose to use Lil Muffy Mopsy and it really was funt o color her dreads! Good morning to you all and hope that you are having a super Sunday . 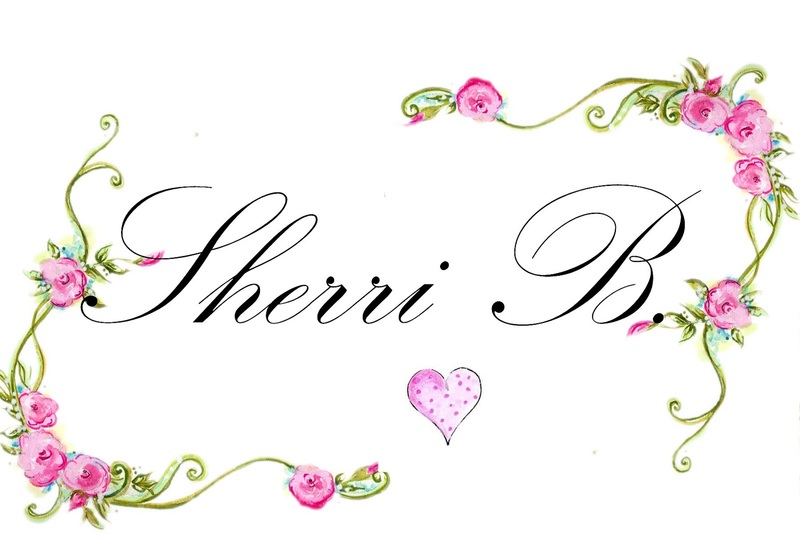 Today i am sharing with you a wonderful new Digi that Sherri has created . Isn't it just beautiful . 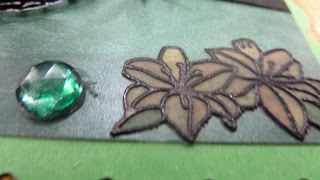 I have used chosen to use red and green backing papers to match the colour of the strawberries and leaves . The image i have coloured using my pro markers and have added a bit of sparkle with some stickles glitter . 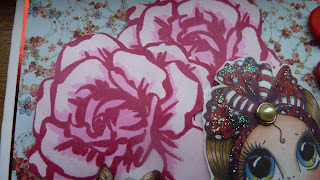 To create the frills and the flower wraps i cut the edges from a large doily and pleated curving it round part of the image edge and around my flowers . 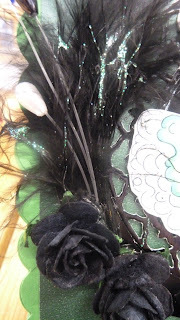 It just gives a feel of using lace . Thank you for stopping by and don't forget to check out Sherri's shops . 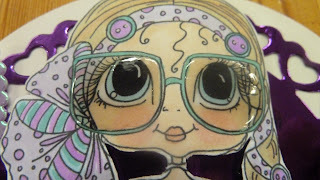 You can find her wonderful work at scrapbookstampsociety or on Etsy . 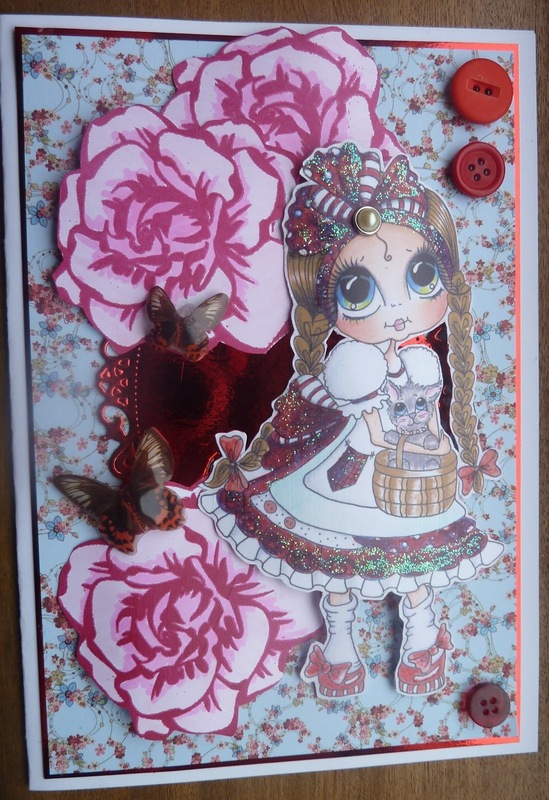 Another card from me today this time featuring the Doroty from Oz bestie. I love this image and have coloured her in reds/pinks just for something different to the normal traditional blue. 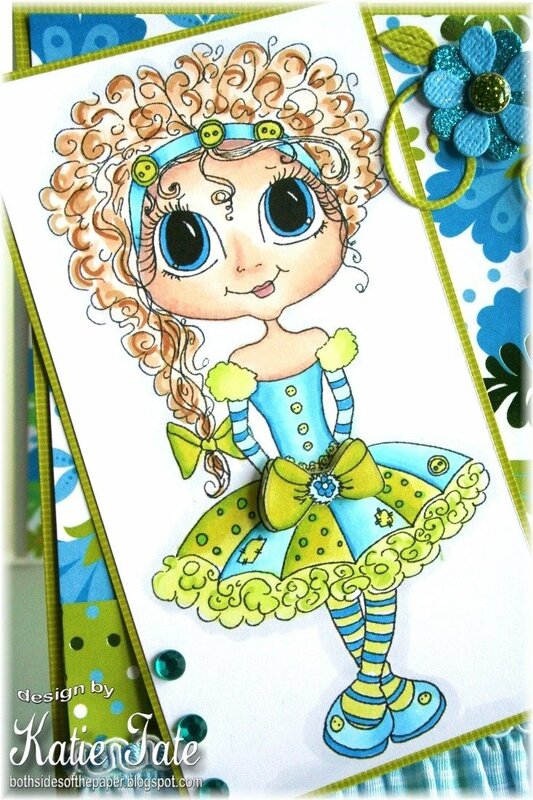 I have used an A5 card front and decorated it with mirror card and creata backing papers. i've used a few (xcut) nesting shaped dies to cut out the motif and som matt&layerimg with silver mirror board which i've also used for matt&latering for the backing paper and the image too. The same mirror board i used to die cut the leaf swirls and curly swirl (dies by Creata), i've used soft pink card and some of the backing paper for the die cut flowers (dies by Creata) and layered these and attached to the swirls topped with mulberry paper roses and a few gems. 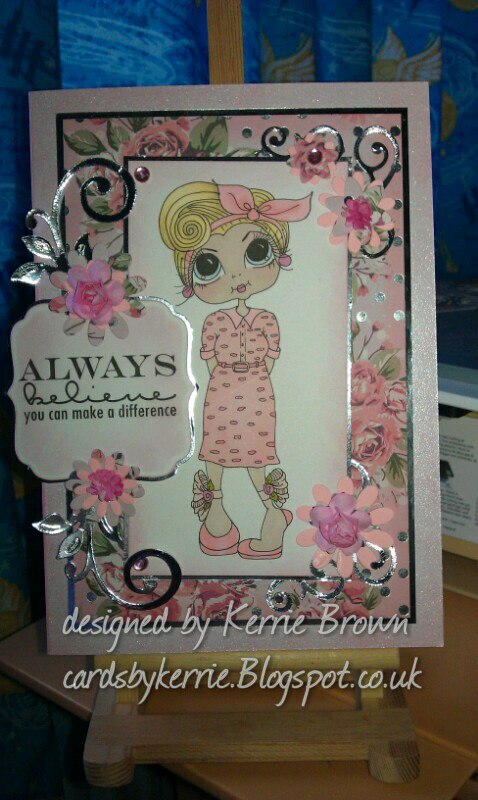 My Besties New Challenge - Think Pink!